If you're in the Military or Law Enforcement; if you ride horses or motorcycles; live on a ranch or a farm - or if the encroaching threats of the urban jungle are simply getting too near for comfort - then the Peace Makers are for you! Unlike many fixed blade knives the Peace Makers can be carried very discreetly. Clipped to the top of your boot and covered by your pant leg they're rendered virtually invisible. Boot carry is incredibly comfortable (as the boot top carries the weight and suspends the knife so it doesn't rub, gouge, or irritate your body), furthermore, your knife is always easily accessible when you need it. 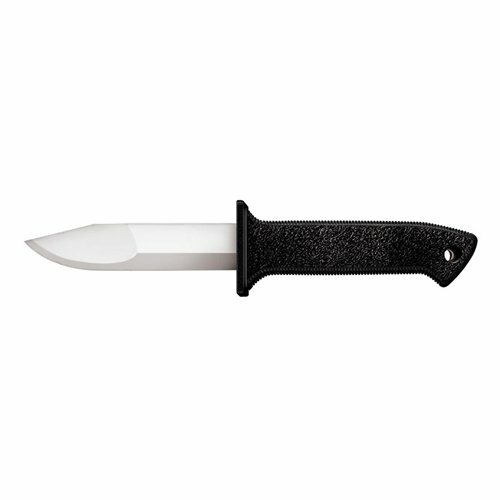 Astoundingly light and thin - the largest model, with it's 5 1/2" blade weighs a paltry 4.7 oz. & measures less than 1/2" at its thickest point! That's substantially thinner then many of the alleged "extreme duty" tactical knives available today! The Peace Maker's "Scandi" ground blade bevel makes them very easy to resharpen, while the unique compound ground clip point -provides a very stiff, distal tapered point capable of piercing thick targets without compromising precious cutting power. The Peace Makers offer a versatile spectrum of uses - utility, hunting, fishing and self-defense - so it's fitting that they also have a versatile grip. They feature a thin(more. ).